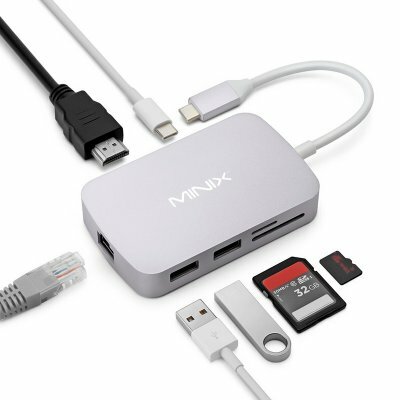 Successfully Added USB-C Multi-Port Adapter - 4K Support, HDMI, Gigabit Ethernet Port, 2x USB 3.0, Micro SD, USB-C Input, SD Card Slot to your Shopping Cart. Connect any external PC accessory to your newly acquired USB-C laptop with the MINIX NEO C-X USB-C adapter. This multi-port adapter brings along great connectivity with its HDMI port, Gigabit Ethernet port, two USB 3.0 ports, Micro-SD card slot, SD card slot, and USB-C input. Simply plug in the adapter into your laptop, and you’ll be all set to connect it to any gizmo out there. This is one of the most advanced USB-C adaptors available that makes sure you’ll never have to worry about the connectivity of your USB-C enabled laptop again. With this PC accessory at your side, any old-school gadget can be easily connected to your new laptop without encountering any difficulties. By supporting an HDMI input, this multi-port adapter allows you to easily connect your laptop to a larger screen. This brings along great efficiency for when you’d like to give a presentation or watch a movie with friends. This HDMI port supports the transfer of 3840x2160p media files. Therefore, you’ll be able to use it for watching the latest Ultra-HD 4K movies on your big screen TV set. Additionally, this USB-C adapter also comes with a Gigabit Ethernet port. This Gigabit Ethernet port lets you connect your laptop instantly to your wired internet for an ultra-fast connection. This USB-C Hub comes with a 12 months warranty, brought to you by the leader in electronic devices as well as wholesale USB accessories.. Charging current is limited to 5V/500mA max.